A small creek and a field with tall grass but separates Katiana’s house from the Summits school in Guindette-Sarazin. 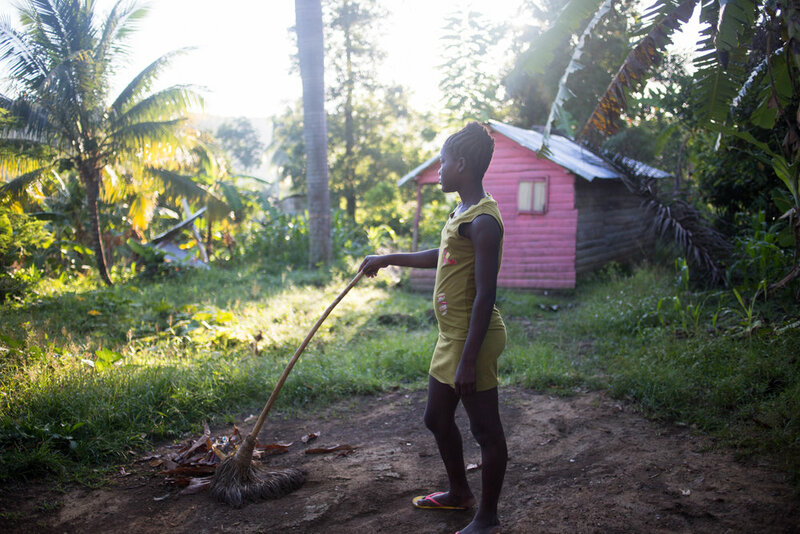 Behind her house is a grove of banana trees, her father has just planted cassava and plantains. It’s the rainy season, and there are many mosquitos here. In a second wooden house, much like the one where she and her younger sister sleep but bigger, her father is finishing with a client. When the client walks out, he has a list of things to buy, and what to do with them to make sure what he asked for happens. When Katiana’s father walks out, he slurs a bit of his words while reminding the client what to do, and when to come back. He’s been drinking Kleren, a pure alcohol made from sugar cane. On Nov. 1 and 2 of last week, Haiti celebrated Fèt Gede, gathering at cemeteries to pay tribute to their ancestors. It was busy at Katiana’s house, with clients in and out, and a big celebration for the occasion. Dancing to twoubadou, dressed in white and purple, the skull of one passed before held over the palms of the living. 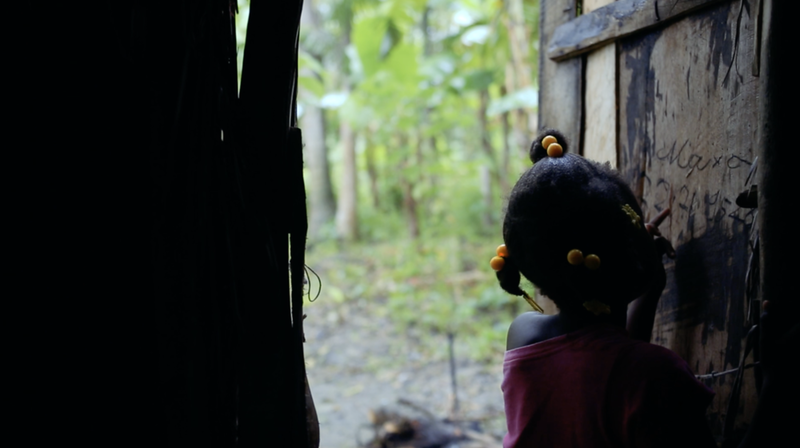 In Katiana’s family, death is another lwa or spirit, a door that marks our passage in life. But even while overcome by Spirit, Katiana’s father talks mostly of his love for his daughter. His tone is impassioned. It’s a dream that doesn’t necessarily rely on Rasin Ginen: the hope that she receives an education, so that she can become what wants to speak through her. Today, we’re excited to announce that the W.K. Kellogg Foundation has awarded Summits a two-year $2 million grant to expand our Whole Child Approach throughout our 40 primary schools. This incredible investment will allow us to significantly raise the level of education available to some of the world’s poorest, and most promising students. We launched Summits highlighting the power of teachers. Through teacher and supervisor training, we sought to equip our educators with the tools they need to create vibrant, instructive classrooms where students are able to learn. The next phase for Summits is the implementation of our Whole Child approach. This approach addresses the many dimensions of a child, ensuring that they are able to flourish in both school and life. To implement this new initiative, Summits will upgrade learning environments, continue to invest in teacher training, and initiate new programs to that ensure each student is healthy, safe, engaged, challenged, and supported. Hire full-time nurses to bring school-based preventative care + non-emergency medical attention to Summits students. Build new kitchens in nine schools, paving the way for over 2,000 students to receive a nutritious meal every day. Transform preschool classrooms with new learning materials, equipment, and 30 trained teaching staff to better engage students at the start of their education. Provide new textbooks for 3,000 students in grades three through eight. Expand 10 schools to include grades seven through nine, enabling 1,000 students a year to remain in school. This means building 30 additional classrooms and hiring 30 additional teachers. Fund a second year of intensive teacher training for our 350 Summits educators with our partners InnovED-UniQ. Launch high functioning school councils to bring together all school constituents, including students, teachers, and community members, for reflection, advocacy, planning, and decision making at the school house level. Thank you for helping us saying yes to the possibilities that exist in every child. We're proud and excited to stand with the Kellogg Foundation, our partners, and with each of you to continue to deliver high-quality education to the world’s most vulnerable children. This time of year, and always, I am grateful for you -- those who make our work possible. Let me share a story about the impact of your support. One of the best schools in the Summits network is St. Paul de Morne Thomonde, located on the outskirts of a small farming city. We often bring visitors to St. Paul to show what’s possible: classrooms are filled with skilled, compassionate teachers and students are active participants in the learning process. On a recent visit, Principal Alfred Metivier grabbed my arm and introduced me to Richard, one of the school’s brightest pupils. Principal Metivier, who I have known for years, always loves to highlight his students but Richard, he said, was particularly special. I was immediately struck by Richard’s maturity, he seemed wise beyond his twelve years. He spoke passionately about his love of math, music, and art. Hardship, I thought, often spurs maturity, and I soon learned that Richard had lost both of his parents at a young age. While other children mightt have dropped out of school, Richard only charged ahead. Over the summer, he raised two goats to sell in order to pay for his school fees. With the leftover money, he bought school supplies and a new uniform. On Saturdays and over holidays, he works at a local mechanic to support himself. Richard understands that his education is the only way to achieve his dreams. His entrepreneurial spirit will be strengthened through education, and his dreams made possible because of supporters like you. Richard’s unwavering commitment to furthering his education - even amidst great hardship – is a theme I see across our communities in the Central Plateau. Now more than ever, families recognize that pursuing an education is the only pathway out of poverty, and towards a life that is lived, not survived. We created Summits for students like Richard. Ambitious students that deserve access to an education that nurtures and challenges them in a community where they feel safe. We cannot do this important work without you. Please consider making a gift to Summits before the year end to ensure students like Richard have the opportunity to thrive. With love in my heart, thank you. This year was a BIG year for Summits. In March, we launched the Teacher's First Campaign. Over two months, we highlighted the transformative power of teachers and asked you to help us raise $100,000 to fund innovative teacher trainings for our 350 Summits educators in our network. You delivered - together we raised $130,494! This money went straight to the Central Plateau where we held an intensive teacher training institute over the summer with the help with our incredible partners InnovED-UniQ. As soon as school started, we noticed a difference in our teachers and in our classrooms. Check out our latest report highlighting the impact you made possible. One of my biggest childhood regrets is that I didn't take advantage of education when I was growing up in Boston. I was a late bloomer, but in a country with so much opportunity, I was able to find a path that led me to a successful career in software engineering. Our kids in rural Haiti live a very different life than those of us in Boston. 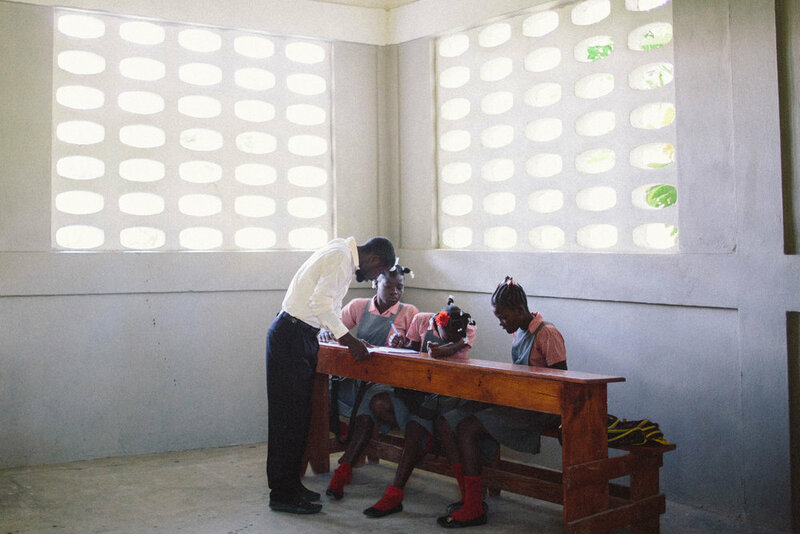 In Haiti, education is the difference between making it or not. The difference between getting a job to advance the community or having only one path as a subsistence farmer. Through education, kids in the 40 Summits primary schools can follow a very different path. Those lucky enough to have a K-12 schooling end up in careers in healthcare, government, tourism, manufacturing, agriculture, and technology. I am 100% sure that those children will transform Haiti. Since founding Summits two years ago, we’ve seen many lives and communities changed in the Central Plateau, but to continue, we need your help. I’ve seen the transformations with my own eyes. When I visited classrooms in the spring, I saw learning patterns typical of schools I’ve visited in other developing countries. Learning was by rote. A teacher was in front of the class reading, and students sat or stood in tight rows, repeating what the teacher said, even if there was no understanding of the materials presented. Over the summer, Summits began an intensive educator training program, working with our partners InnovEd. When I visited these same schools in September, just a few short months later, I saw a transformation. The school day now starts with kids and their teachers standing in a large circle outside their school playing games and talking with excitement about the day ahead. As a result, more kids are showing up to school on time, ready to learn. The biggest change has transpired inside classrooms. Now, desks are organized in circles and the teacher's role is to get students to engage and help each other. There is great energy in these classrooms - students are energized, and teachers are energized. The change is remarkable. I’ve spent my career building technology companies, but in Haiti the stakes are so much higher. We don’t need technology; instead, we need to embark on infrastructure improvements - clean water, latrines and building a cooking area at each school so students receive a meal every day. We need to continue to create learning environments nurtured by motivated teachers, who have materials and skills to equip students with what they need to thrive. I ask for your support this year as we work to build safe, vibrant classrooms for resilient, dedicated students. Please consider a donation to Summits Education this holiday season. If you are ready, you can give here. Like my own kids, I want our students to be safe, nourished and challenged. This is our work. On behalf of the entire Summits team and the communities we serve, thank you. This #GivingTuesday, Don't Give to Us. #GivingTuesday was created as an antidote to the mass-consumerism of the holiday season. But this day of generosity is fast becoming a crowded and noisy space where thousands of nonprofits compete on the same day for donors' attention. On this day, your inbox is busier than Walmart on Black Friday as countless worthy causes send their appeals. This year, the country in which we work - Haiti - has suffered another devastating natural disaster. Last month, Hurricane Matthew tore through Haiti’s southwest, leveling cities and killing hundreds. Although many organizations were swift to respond, 1.4 million Haitians are still in need of humanitarian aid. 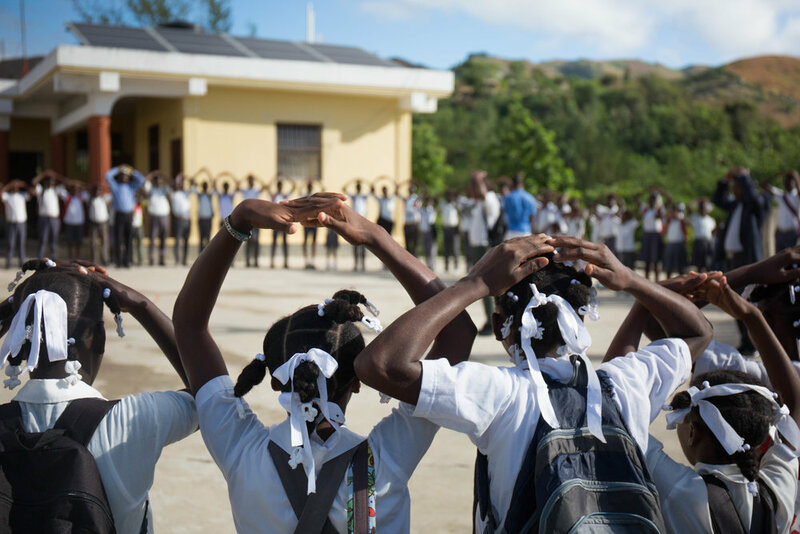 Our 40 primary schools and communities in Haiti's Central Plateau were spared the brunt of Matthew's destruction. Others weren't as lucky - hundreds of thousands are still desperate for food, shelter, clean water, and medicine. Partners in Health - Partners in Health has worked to improve health care in Haiti for decades. This Giving Tuesday, your gift with be matched up to $350,000. St. Boniface Haiti Foundation - SBHF is the leading healthcare provider in the devastated region with the only functioning referral hospital available to those affected. Food for the Poor - This Giving Tuesday gifts for housing will be matched (up to $2 million) to help build homes for impoverished Haitian families who have been left homeless by Hurricane Matthew. Tomorrow, we'll be back fundraising for the 10,000 students and 350 educators in our primary school network, investing in lasting impact through education. After the earthquake, Yolaine Ciné lost everything. Her home in Port-au-Prince destroyed, Yolaine made the decision to return home to the Central Plateau. With little more than her sewing machine, Yolaine and her daughter returned to her hometown, Bien-Aime, to rebuild their life. In Port-au-Prince, Yolaine was a seamstress. She bought second-hand clothing to fix and resell on the busy streets of the capital. Although it didn’t pay much, her work helped to pay for her daughter to attend school. When she returned to Bien-Aime, she found many children out of school simply because they could not afford uniforms. Without hesitation, Yolaine began giving what she could - her time and talent. 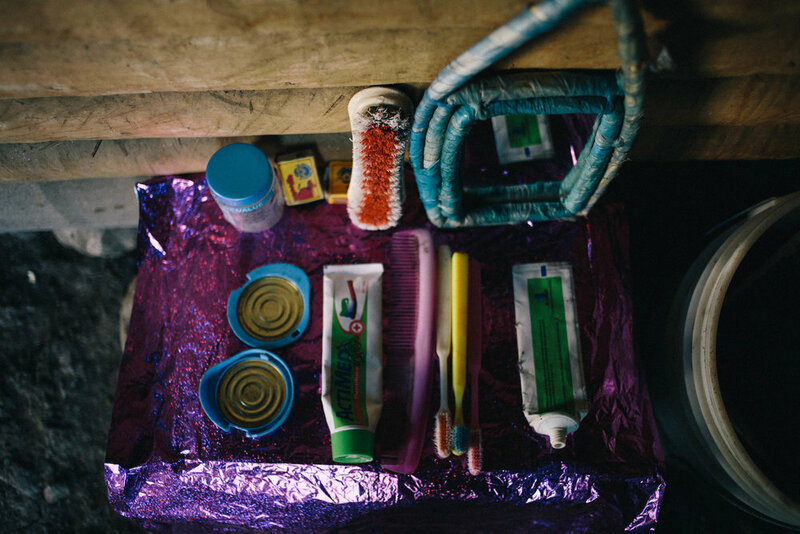 She stepped into help, teaching sewing skills to the students so they could return to school. Yolaine started with 50 students. Today, she teaches more than 70 students with the same tireless sewing machine. Students hike down from mountain villages on weekends to learn from her. Some make uniforms for themselves, others for their sisters, brothers, and cousins. After loss and hardship, Yolaine uses her skills to empower students, selflessly and without pay. She knows that an education is the cornerstone of a healthy, vibrant community. 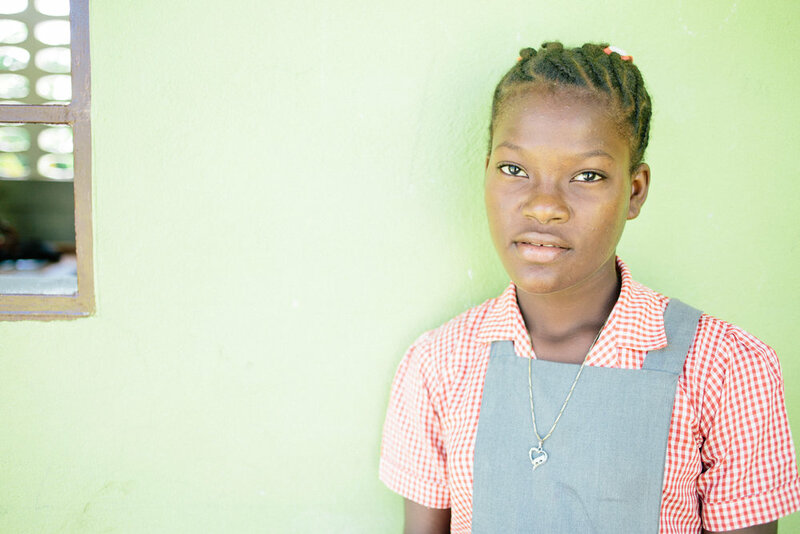 This giving season, we ask you to follow in Yolaine’s generous footsteps by giving education. With your help, students across all 40 Summits schools will have the skills they need to thrive. "We don't want them to live an uneducated life - we want them to have a different life." Step into Madame Riper's home in Cabestor and let her make you a cup of coffee. In case you missed it, Summits co-founder Paul English was featured on Chronicle on WCVB Channel 5 this week. Learn more about Paul, his latest venture Lola, and his work with Summits Education above.